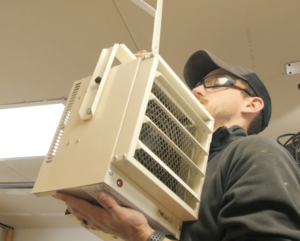 It’s been pretty cold in my shop of late so this week I’m showing you how I plan to keep the shop warm by installing an electric garage heater! This requires the installation of a 220v circuit so I’ll show you all the steps to install a dedicated 220v circuit to run this heater. 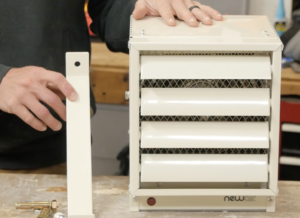 Watch the video for step-by-step instruction and make sure to stick around for a 20% Discount code on the purchase an electric garage heater from New Air. Please note that working with 220v power can be dangerous. 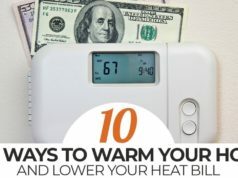 If at any time you are not 100% comfortable installing this heater or cannot perform the steps safely, contact an electrician to run the necessary power supply for you. Disclosure: This post contains an unpaid product integration by New Air. All views and opinions herein are my own. 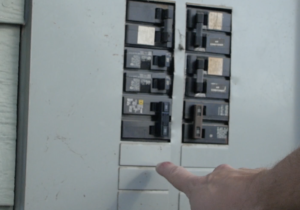 First and foremost when working with electrical, you should always turn the power off at the breaker panel for the area you are working. In this case I am working in the main panel so I shut off the power to the house. You’ll also need to verify that you have existing space in the panel available to install a new 220v dual pole breaker. In my case, I was able to drill a hole through the wall from the panel to the workshop since they shared a wall. 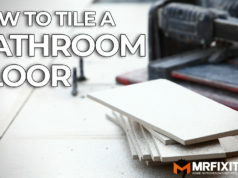 Depending on the location of the panel and your access to it, you may need to open up a section of the wall around the panel or connect conduit along the outside of the building. Each home is different so understanding your home is important in determining how you are able to run the conduit. If you are working inside the wall, you can use Romex cabling instead of conduit but any electrical that is run on the outside of a wall needs to be encased in conduit of some kind. 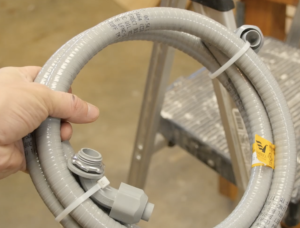 I’m using 1/2″ EMT conduit along with a combination of fittings, elbows, and connections which you can find in the electrical aisle of the hardware store. 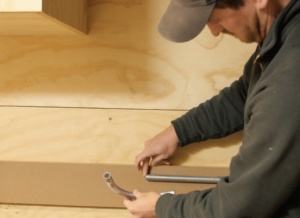 Use a pipe cutter to cut the conduit to the required lengths. 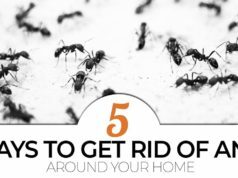 You’ll need to find a location in your garage to hang the heater that is out of the way of garage doors, or overhanging obstructions. 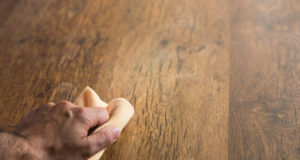 You’ll also want to make sure that the heater doesn’t directly vent squarely onto a wall or surface that is susceptible to heat to minimize the risk of fire. In my case, I am running the conduit up the wall and onto the ceiling so that I can hang the heater near the center of my shop but away from the garage door. 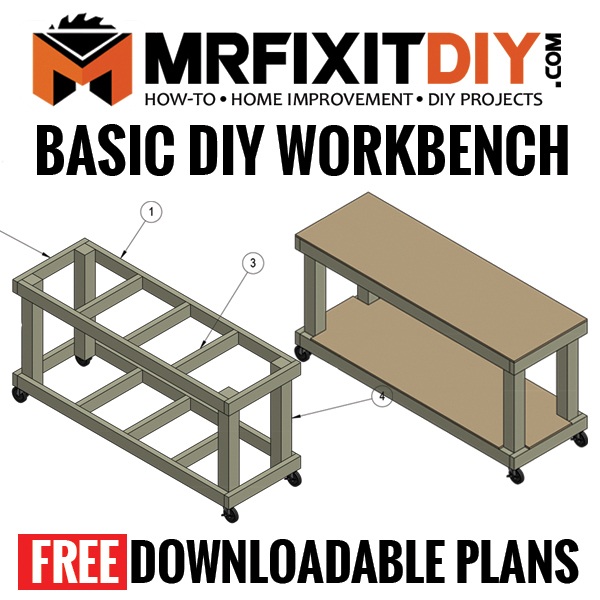 I’m using 4″ junction boxes to provide easily accessible areas where I can access the wiring should I need to make any changes or adjustments down the road. For this project I am using 10 Gauge stranded wire in Red, Black and Green. The Red and Black wires will be the alternate phase hot wires and the Green wire is the ground wire. Because this is a 220v circuit, a white neutral wire is not required. 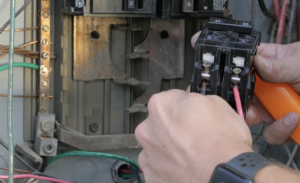 To install the wiring to the breaker panel, I feed the 3 wires out through the conduit into the panel and then connect the Green ground wire to the ground bar in the panel and the Red and Black wires to the terminal screws on the breaker. This is a 30 amp breaker because the average draw of the heater is 21 amps. 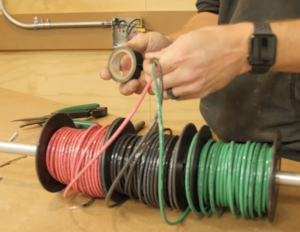 Using a fish tape, I feed it down from the ceiling junction box to the lower junction box and then attach the wiring by bending it around the fish tape and securing it with electrical tape. 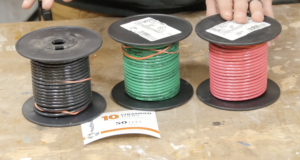 Using a extra piece of conduit to mount the spools of wire onto allows the spools to free spool as you pull the wires back up through the conduit with the fish tape. 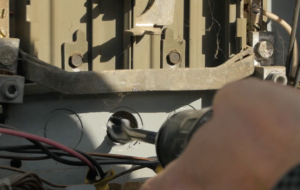 In addition to connecting the ground wires to each other and wiring to the breaker ground bar, each junction box will need to have a grounding pigtail attached to it to ground the junction box. 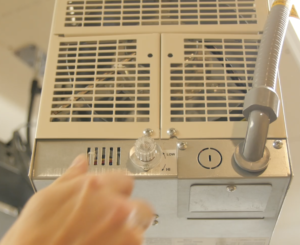 Installing the heater in place is a relatively simple task compared to the rest of the project. 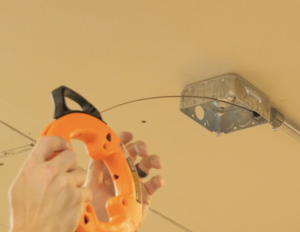 Choose the location of the bracket and mount it to the ceiling or wall as needed. In my case I located a stud in the ceiling and mounted the bracket in place by pre-drilling and securing it in place with a couple of lag bolts. 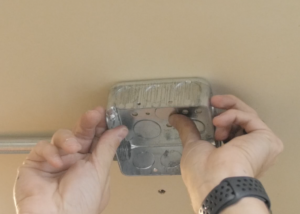 Once the bracket is installed, mounting the heater is just a matter of using the included carriage bolt and spacer to hang the heater from the bracket and then securing it in place with the included nut. 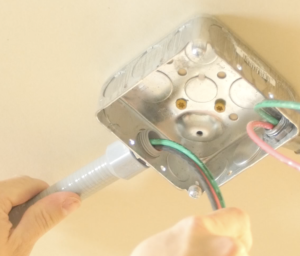 To connect the wiring from the heater to the junction box in the ceiling I am using a flexible appliance whip that I picked up at the local hardware store. Run the wiring through the hose and then connect it to the junction box and the heater using the included attachments. The wiring of the heater itself doesn’t match the color scheme of the wiring I am running but the white and black wires are the hot wires, and the yellow wire with the green stripe is the ground wire. Connect the wiring using some wire nuts and then close up the heater. Lastly connect all the wiring in the junction boxes by connecting like colored wiring with wire nuts and putting cover plates on the junction boxes. Lastly turn the power back on at the breaker and turn on the heater. Within about 2 minutes of the heater being on my shop had warmed up substantially. It has an adjustable temperature control knob so you can turn it on low if you only need a little bit of heat or you can crank it up to high and really pump out a lot of heat. Having a heater in my shop is not something I’ll use all the time, but it is going to be a really nice thing to have when I do need it. 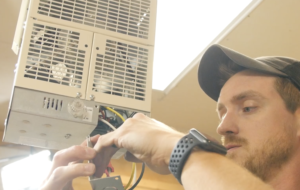 I hope this video and post were helpful to you in showing what is involved in running your own electric garage heater. 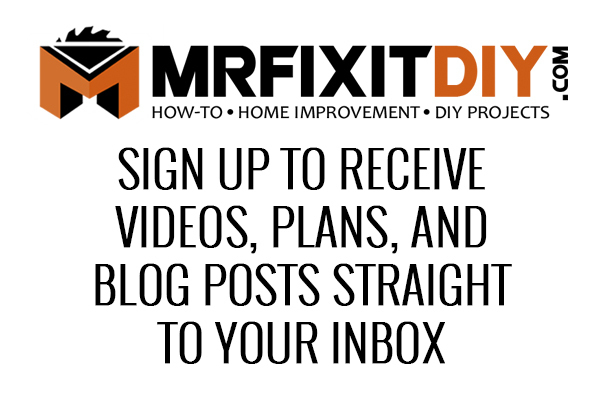 If you’d like to purchase your own New Air electric garage heater, you can use the Discount Code “MRFIXIT” here and get 20% Off your order. Thanks so much for watching and good luck!